Hello friends! 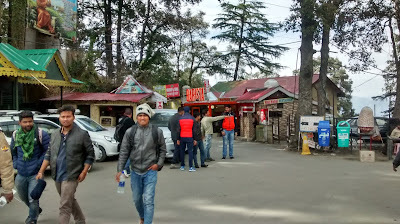 You must have been to many hill stations and each of them has a unique charm of it's own. But most of them are crowded and sometimes do not offer the kind of experience, one is looking for. However, there are a few places, which are relatively untouched and give you ample opportunities to satisfy your exploratory instincts. One of such places is Gaganbawada. A very less explored but an extremely beautiful small hill station, it has something for everyone. Gaganbawada is a town in Kolhapur district of Maharashtra state in western India. It is located in Sahaydri ranges or western ghats at an altitude of 3000 ft. The main feature of this place is that it gets maximum rains during the monsoons. This is probably the only place where two ghats originate at one place and move into different directions from here. The two ghats are Karul Ghat and Bhuibawada Ghat. While Karul Ghat moves towards Talere Kankavali, the other one i.e Bhuibawada Ghat moves towards Kharepatan-Rajapur. Gaganbawada is an ideal place for natural sightseeing and of late has become a favorite spot for film shootings. It offers an awesome view of the Konkan coast and the greenery spread allover is a treat to the eyes.This beauty is glorified during minsoons when the place is in full bloom and offers a majestic sight. The place has a comfortable and serene climate in the midst of the nature. 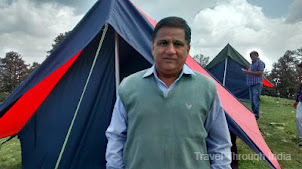 There are number of places in and around Gaganbawada to explore. There are apmle opportunities for sight seeing as well as indulging in adventure. 1. 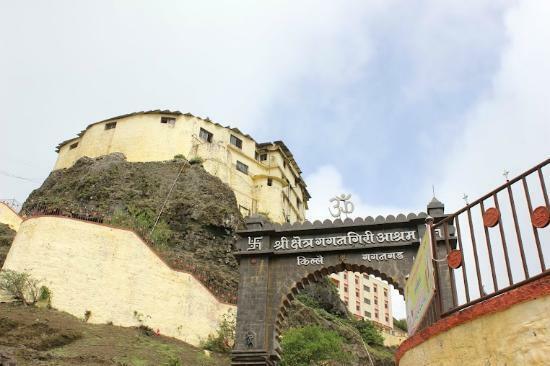 GAGANGAD FORT - Located at just 1 km from Gaganbawada is the Gagngagad fort. It is believed to have been built by Raja Bhoj of Shilhara dynasty in the year 1190. However, British demolished it in the year 1844, but even the ruins of the fort are a treat to watch. You get an amazing view of the Karul Ghat, Bhuibawada Ghat and surrounding valley, from the top of the fort. A small mosque and a Bhawani temple exist inside the fort. Then there are natural caves here. It is said that Gagangiri Maharaj used to meditate inside these caves. 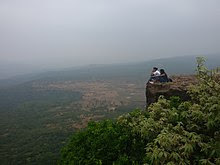 You can add adventure to your visit to Gagangad fort by trekking to this place from Gaganbawada. There is a comfortable trekking trail to reach here. 2. 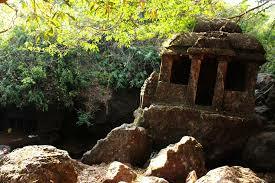 PANDAV CAVES- Situated 8 km(5 mi) from Gaganbawada are Pandav caves. Located near a small village called Palsambe, these caves are commonly called Ramlinga Caves. It is believed that Bhim of Mahabharata carved these caves in just one night. These caves are located in a small gorge, which has been created by a stream. There are three structures here, which are said to have been used for meditation in earlier times and are generally referred to as "Sadhana Ghar". 3. 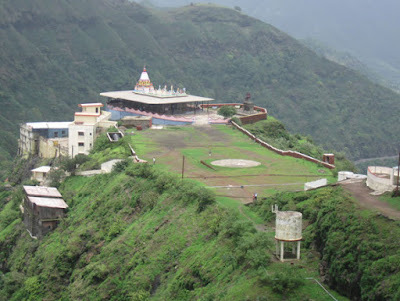 MORJAI TEMPLE AND PLATEAU - This is a place for hiking enthusiasts and religiously inclined. Morjai plateau is situated 8 km from Gaganbawada at a height of 980 m. Just drive down to the base of the hike and then hike up.The hike is not very steep and you can cover the distance in roughly 45 minutes. Once you are on top, you will find a beautiful cave temple of Goddess Morjai. People here believe that Morjai is the Goddess of peace. They solve all their disputes in the temple, in front of the Goddess. At the end of the monsoon season, the plateau is carpeted by wildflowers and it's scenic beauty is to be seen to be believed. 4. GAGANGIRI MAHARAJ MATH - This is a place where Yogi Gagangiri Maharaj used to do his meditation. This is basically a cave temple. Pictures of Lord Rama, Sita, Laxman and God Hanuman are carved on the outer walls. The place inside the cave temple, where Gagangiri Maharaj used to meditate and perfected his tantrik skills, is known as Garbhagiri. The temple now serves as an ashram of the devotees of the Yogi. Many devotees of Ggangiri Maharaj visit this ashram to seek spiritual blessings and to meditate. Yoga programs, Hindu teachings and Meditation courses are offered in the Math. Datta Jayanti is one of the main festivals of Gaganbawada town and a large number of devotees visit Gagangiri Maharaj Math during this festival. 5. KARUL GHAT AND BHUIBAWADA GHAT - These are two of the most scenic beauties of the area. 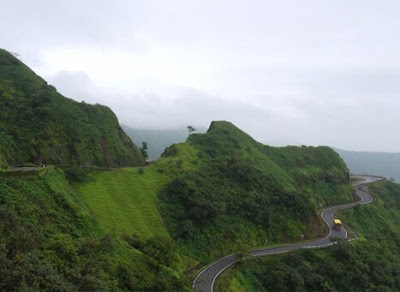 These stunningly beautiful routes originate from Gaganbawada and connect with Konkan coastal area of Maharashtra. Both these Ghats start immediately after Gaganbawada. Karul Ghat is 19 km(12 mi) in length and goes towatds Vaibhavvaadi and meets National Highway 17. It has pretty good roads and the drive in the midst of natural beauty all around will leave you spellbound. Bhuibawada Ghat on the other hand is smaller in length. I t is 11km (7 mi) long and road condition is not that good. But again, the natural beauty all around, including hills and valleys is a treat to the eyes. It goes to Bhuibawada village. When you start fromGaganbawada on these Ghats, you will get a few spots from where you can get a beautiful view of the sunset. Gaganbawada is very rich in biodiversity. The forests around it have more than 120 species of birds and 50 species of buttrflies. Also, approximately 21 species of mammals inhabit the area. These forests are also home to many herbs and medicines. It is a paradise for nature enthusiasts. Air - The nearest airport is Pune, which is 290 km(180 mi) away and is well connected to the rest of the country. Railway - The nearest railway station is Vaibhavwadi which is 20 km(12.5 mi) away. Kolhapur railway station is the major station which is 50 km(31 mi) away. You can get taxis or state run buses from here to reach Gaganbawada. Road - Gaganbawada is situated on NH-115 and is well connected to other cities. The town is served by state run buses from Kolhapur, Vaibhavwadi and Kharepatan at good frequency. A few state run buses running from Mumbai and Pune to Goa also pass through this place and can drop you at Gaganbawada. There are hotels for all budgets in Gaganbawada. Then there is MTDC government resort which is at a convenient location and and offers good accommodation. Gaganbawada has something for everyone. While it gives a scenic view of the high mountains of beutiful Western Ghats, the lush green hills are a treat to watch. For nature lovers, this place is very rich in flora and fauna. It also has historical and mythological value. And to top it all, the serene and calm surroundings of the town are a gift. Thanks for sharing and please keep us informed with new information when possible. I have some related information you may Visit Travel World for trusted Guideline. Thanks and glad you liked this post. To keep getting information regarding new posts, subscribe to my blog by registering with your email id. Beautiful post! I like your blog!